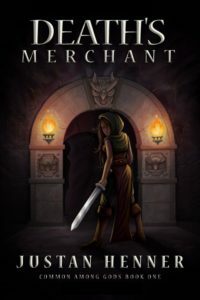 Hey everybody, I’m excited to finally reveal the book cover for my first book, Death’s Merchant. Special thanks to my designer, Neil Robinson. You can see more of his work at InsaneRide.com. Death’s Merchant is a book about a war between the gods. They’re fighting over the ascension of a god of Death. Mortals become unwitting pawns it the gods’ war. The book has a dark concept that I’ve written in a light hearted way. If you want to see what I mean, start by reading these introductory short stories to Death’s Merchant. Of course, you can get a copy of the book here or read it on Kindle Unlimited for FREE.